This past weekend was the inaugural WikiConference USA, a New York area conference focused on all things wiki. I presented a summary of our work with PS 9 at a session on Saturday morning and was privileged to share a track with Gabriel Thullen, a Swiss computer and media teacher who helps students contribute to Wikipedia as early as 7th grade. It was wonderful to see others who are working directly in schools and, as always, I was very pleased to talk with language teachers from as far away as San Francisco and Canada. Every time I meet with people from the Wikipedia community I am struck by how strongly our goals for spreading knowledge and our values of openness, participation, and empowerment align. It is a welcome change of pace from stories about how technology is being used to surveil whole societies and how the tools of education are being used to build profiles of children. Now that we have reached the one year anniversary of Edward Snowden’s revelations I think we can all use a reminder that we can have a voice in how the technologies in our lives develop and whether they are used to support our values or undermine them. For myself, interacting with the other participants at WikiConference was that reminder. 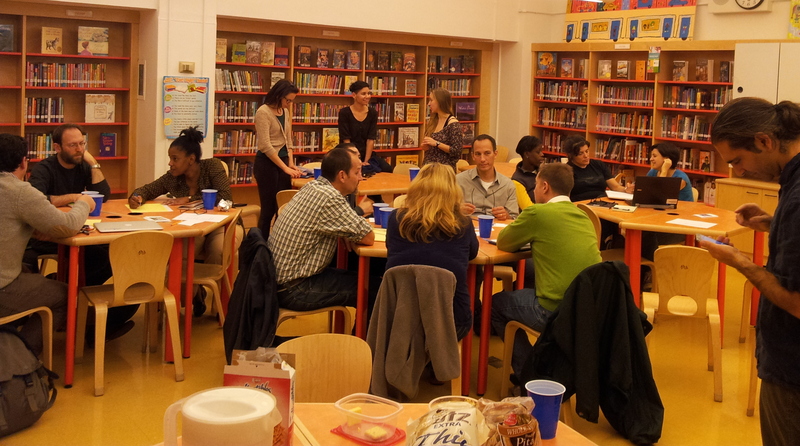 Last night we began the second stage of the Last Language Textbook campaign at Brooklyn’s PS 9 elementary school. Fifteen parents and teachers gathered together to start a new language exchange organized around the materials that Wikiotics Fellows Claribel Sanchez and Jarrett Carter spent the summer building. I am happy to report that everything went very well and the group is scheduled to meet again on December 2nd to continue learning basic Spanish vocabulary and practice their first English/Spanish dialogues. Any Spanish or English speaking parents in the community who would like to participate, please email contact@thelastlanguagetextbook.org. After December 2nd there will be a more formal schedule for the spring term meetings and we will post about it here. How do you build globally useful teaching materials? In the first year of our Last Language Textbook (LLT) campaign we have tried a number of approaches, from international workshops to online courses. Our conclusion? Start by building materials that are immediately useful to one community and empower teachers to adapt, rebuild, or share those materials for use in different circumstances. For the second year of the LLT campaign we are taking that lesson to heart and refocusing our international efforts locally on the dual language program at a Brooklyn elementary school. The PS 9 Teunis Bergen School in Brooklyn is a public school with a young but growing dual language immersion program. Built by talented staff, an engaged community of parents, and a supportive administration, it is an exciting program looking to reach more of the local community. To help support this effort we are launching the Wikiotics Open Education Design Fellowship and selecting Claribel Sanchez, one of the teachers from the program, and Jarrett Carter, a local education technology graduate student, as our first pair of Fellows. Fellowship support will enable Claribel and Jarrett to spend the summer building free online materials that support the school’s curriculum while also serving as a resource for parents, other teachers, and self-directed students in the wider community. This work will incorporate both the Wikiotics tools and the WikiBook platform, the first of what we hope will be many technological collaborations for our project. The goal of all this activity is to teach parents of PS9 students enough language skills that they can practice with their children at home and communicate with each other at school events. This work will be available in English and Spanish and we hope will it become a useful resource throughout the New York City school system. In addition to our fellows I am excited to announce that the New York Wikipedia chapter will be joining us to support this effort. The NY chapter regularly organizes community events that share local voices, pictures, and knowledge with the millions using Wikipedia online. At the end of the summer they will be lending that expertise to organize a local event where anyone in NY can come to help translate, illustrate, or add audio and pictures to enrich these free language materials. If you are interested in helping some families learn, supporting a local school, or building up the language instruction materials freely available online, keep your calendars open. We will be announcing final dates later this month. This summer push is just the beginning of our local focus for the LLT campaign. We look forward to continuing to grow our community roots with PS 9 and to planting seeds in other communities. By using online collaboration tools like Wikiotics and WikiBooks to help facilitate local activity, our community work can extend far beyond our community borders. Working together we can build locally and share globally. Thanks as always to our sponsors the Linux Fund and Gandi.net for their support of the LLT campaign and special thanks to Matt Curinga for all his local outreach work this spring. 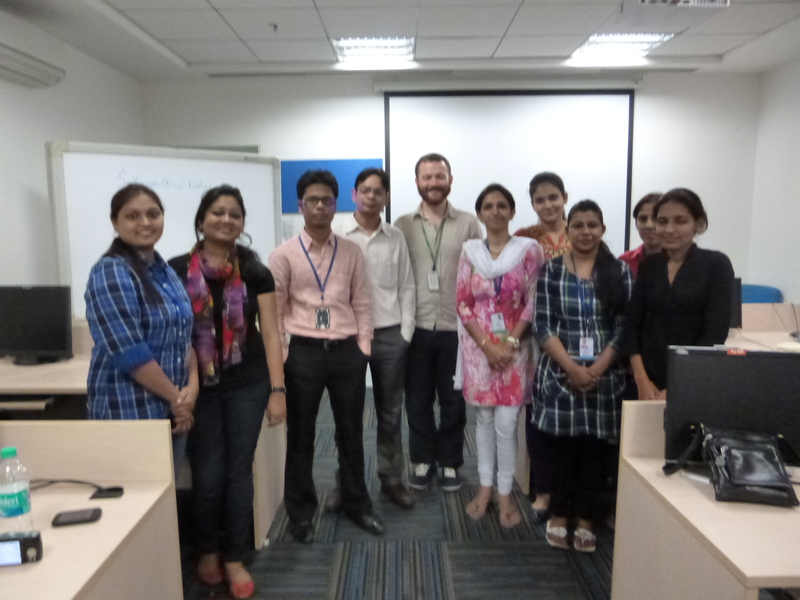 On October 25th and 26th I was in New Delhi running the second workshop in our Last Language Textbook workshop series. A dozen teachers from all over India and I spent two days exploring the capabilities of the Wikiotics tools and building lessons for their students. You can see all the lessons we built on the Indian workshop page, including our second Panjabi lesson and this great podcast lesson on asking permission, which was written from scratch by two teachers who were completely new to Wikiotics. It was a great two days and I am excited to continue working with the whole group as they build Wikiotics into their classes going forward. I want to thank NIIT’s Yuva Jyoti centers for hosting the workshop and our sponsors Gandi.net and the Linux Fund, whose continued support makes this LLT campaign possible. I am particularly grateful to have met all the Yuva Jyoti teachers, who came from half a continent away for the workshop. It was great to meet everyone and I learned a lot about the different challenges and opportunities of teaching in many of India’s regions. We are looking to run the third LLT workshop over winter break or early in the spring semester. If you are interested in participating in this next workshop, or your school or organization might be interested in hosting that workshop, please send me a note at: contact@wikiotics.org.